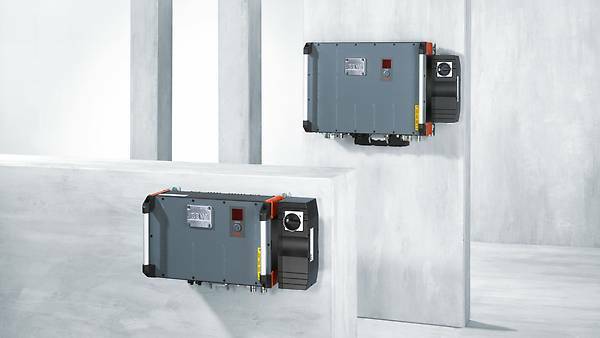 The compact drive and positioning inverter saves on space and reduces the complexity of your systems. Thanks to decentralized technology, it has a high level of integration and can replace entire control cabinets in the field. Do you want to significantly reduce the complexity of your system architecture? Are you looking for a practice-oriented drive solution that takes up little space and is resistant to vibration? In that case, the MOVIPRO® SDC drive inverter with positioning control from our decentralized drive technology portfolio is the right choice for you. The compact unit provides a high level of integration and can replace entire inverter control cabinets in the field. It also has the advantage that the controller is located near the drive. In this way, you can install autonomous drive sectors and network them with the MOVIPRO® SDC. Depending on your regional requirements, communication is possible via all common bus systems: PROFIBUS, PROFINET, DeviceNet, EtherNET/IP and MODBUS/TCP. Conveyor systems and machines that have consistent, decentralized drive technology such as this are far superior to comparable centrally-controlled systems. Standardized 1-axis application modules make project planning significantly easier for you. You can use them to implement speed control and positioning commands conveniently, simply and quickly at any time. There is also no need for programming because parameterization is performed by the user. The standard control technology also ensures consistency within your system, as the flexible, field-oriented inverter can control both asynchronous and synchronous motors. Furthermore, the inverter includes local I/Os and supports various brake voltages. Create the basis for open and flexible system architecture with the MOVIPRO® SDC drive and positioning controller. Regardless of whether you are designing a new system or modernizing an old one, functional compatibility with existing control cabinet applications is guaranteed. When combined with our MOVITOOLS® MotionStudio you can benefit from an integrated software environment for your entire engineering process – from startup and diagnostics right through to maintenance. Our global network ensures that we are close at hand, wherever and whenever you need us. via the simple user-defined parameterization without the need for programming and via standardized 1-axis application modules. due to the high level of integration and communication across all common bus systems. thanks to decentralized engineering and easy connectivity, allowing quick retrofitting of systems and a reduction in wiring errors. thanks an integrated installation concept for the entire materials handling technology. Same software tools for operation/diagnostics. thanks to communication via common fieldbus systems and support for a wide range of motors (asynchronous and synchronous).